Bitcoin opened the year 2017 at USD 963 and closed at USD 13657, registering a growth of over 1,300 percent. 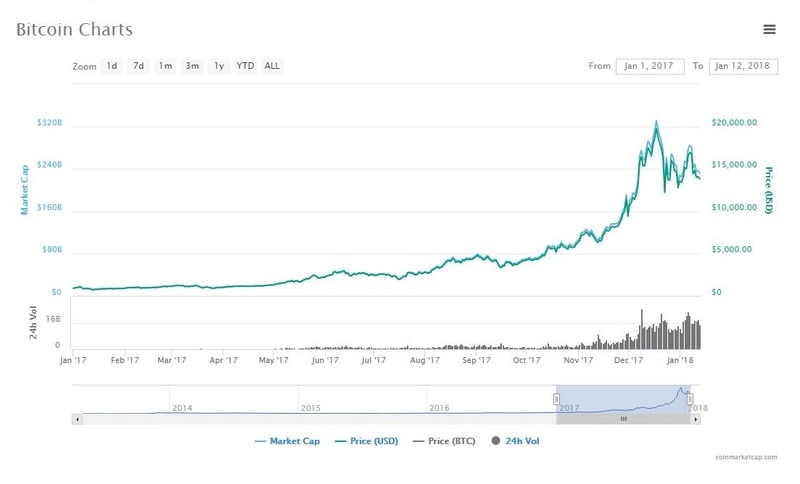 The market cap of the cryptocurrency also surged from USD 15.5 billion at the beginning of 2017 to USD 236.7 billion on December 31. 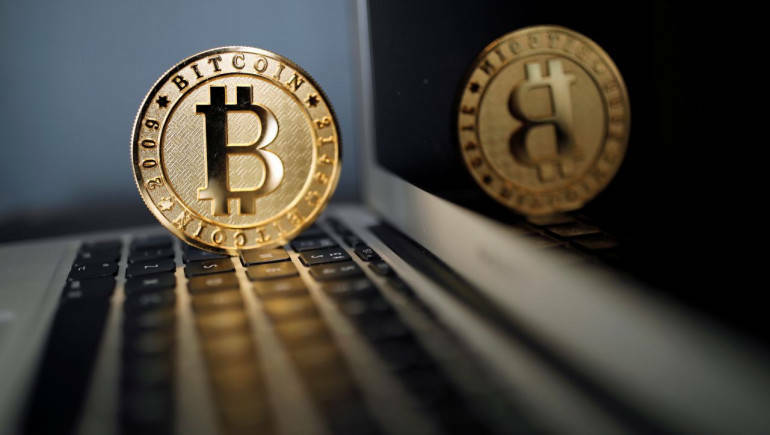 In the process, on December 17, Bitcoin touched a record exchange price of USD 20,089 and the corresponding market capitalisation of USD 326 billion, also the highest ever in its short but volatile nine years of existence. However, with the unprecedented surge, 2017 was also marked by a steep decline in the dominance of Bitcoin in the cryptocurrency market cap. 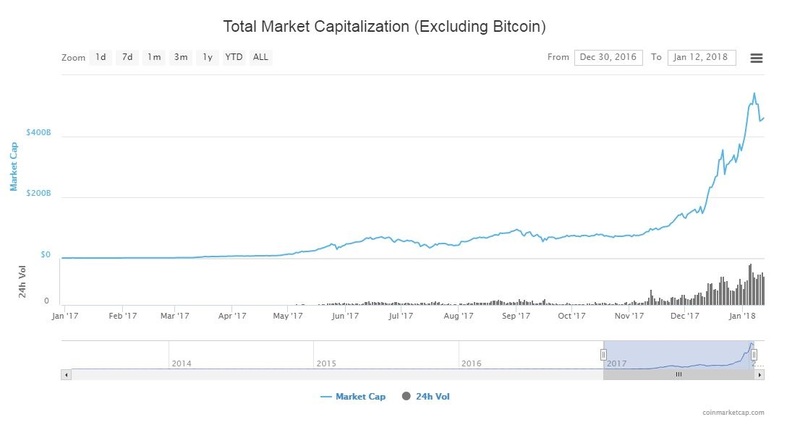 The dominance of Bitcoin, i.e., the share of Bitcoin’s market cap in the total market cap of cryptocurrency market, was 87 percent at the beginning of the year, which came down to 38 percent on December 31. It has further reduced to 33 percent on Thursday thanks to a late bearish trend in the market. During the last year, the investors were not bullish on Bitcoins only. Other cryptocurrencies also rallied on the back of comparatively greater attention from people betting in the market. The volume of investment in cryptocurrencies other than Bitcoin can be assessed from the rise in the combined market capitalisation of other cryptocurrencies. Data shows, on January 1, 2017, the total market cap of cryptocurrencies excluding Bitcoin was mere USD 2 billion which zoomed to USD 348 billion by the end of the year. Explainer: What is bitcoin and how does it work? 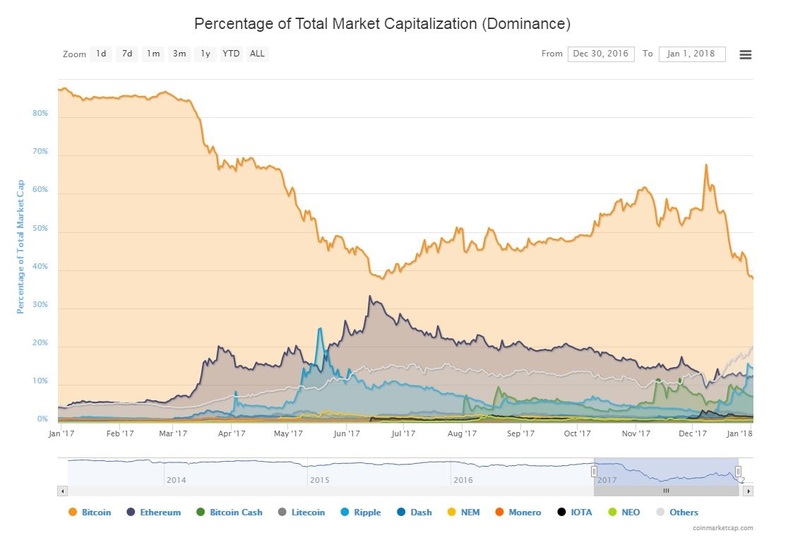 A look at the graph picturing the dominance of major cryptocurrencies (below) shows that the decline of Bitcoin’s dominance coincides with the rise in the share of Ethereum and Bitcoin Cash till mid-2017. After that, Bitcoin regained some of its lost space in the second half of 2017 till mid-December before another decline started. On the other hand, the second half of the year also marks the decline in the dominance of other major currencies including Ether, Bitcoin Cash, Ripple, Litecoin, and others. At the end of the year, no currency other than Bitcoin had a share more than 15 percent of the total market cap of all cryptocurrencies. Another look at graphs and it can be inferred that the 24-hour trade volume for all cryptocurrencies saw a significant surge in November and December, however, we will focus especially on currencies other than Bitcoin. Though, fact remains that Bitcoin is the most traded currency in the market as the daily trade volume for Satoshi Nakamoto’s brainchild remains above USD 10 billion on regular basis, intermittently also crossing USD 20 billion. However, one cannot deny that currencies other than Bitcoin have generated increasing interest from the investors. They are now more confident of betting on newer currencies than ever. This brings to another phenomenon of the year, the increased incidence of initial coin offerings or ICOs. As per stats provided by CoinSchedule, which tracks ICOs, there were in total 235 coin offerings in 2017 which raised over USD 3.7 billion for their promoters. September was the most fruitful year with investors betting more than USD 800 million on ICOs. Comparatively, 2016 saw just 46 ICOs which had raised mere USD 96 million. The increased number of ICOs meant that there were a greater number of options for the investors, which again was detrimental to the monopoly of Bitcoin in the cryptocurrency market. And, what is more, a slew of ICOs including camera maker Kodak's KODAKCoin are listed to open in 2018. Note: Unlike the listed companies which release a fixed number of stocks for trading, fiat currencies don't have market-cap as there is no ceiling on their possible number. However, in case of cryptocurrencies, more often than not, the number or 'volume' of currencies is fixed (for example, 21 million for Bitcoin), very much like stocks. This difference and/or similarity allows us to calculate market-cap of cryptocurrencies. For the analysis above, the market caps have been calculated by multiplying price to the circulating supply, akin to the free float method used for listed companies.